From pocket kites to huge 6' span flyers. These kites will satisfy everyone from the first-time flyer to the experienced . This nylon kite unfolds from the 3-1/4� zippered pocket pouch read to fly! Great for spontaneous kit flying on beach trips or hikes. Includes kite string and winder. Solid pink color diamond kite. Perfect for first-time kite flyers or those who prefer a traditional kite. Beautiful applique design rainbow Fly-Hi kite! Measures 65" long and 29" wide with 52" tails. Made of Ripstop Nylon & fiberglass frame. Perfect for the Disney lover! 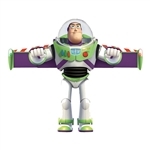 See Buzz Lightyear fly through the air with this detailed printed Licensed SkyPal Kite from X-Kites WindNSun.